Congratulations on getting certified to teach yoga! That is a big first step. Take a deep, long inhale and be proud of your achievement. Take a big breath in…and as you exhale, feel that it’s time to share all that you know. Here in San Diego, I am the general manager of a two-studio operation which serves over 1,000 yogis a week. The finest teachers that we encounter are those who are sincerely interested in sharing the benefits of yoga with others. That is their prime motivation when they step to the front of the room, although of course, bills also have to get paid, and this is a worthwhile concern as well. As you look forward to embarking on your career teaching yoga, don’t forget to look back to your reasons for trying yoga in the first place. What were you searching for that brought you to the practice? And later on, what was your motivation for getting certified to teach? I would guess that most teachers are inspired by the personal transformation they have seen as a result of the practice. You know that yoga works. Now you want to share that with others. But where to begin? And how? Although your desire to share the practice is essential, you will not be able to continue with this work if teaching yoga doesn’t meet your personal needs. How Important is Material Compensation? One important question to ask yourself is whether you want material compensation for what you offer. Maybe you already have a full-time job, and you don’t need to be paid for the class or two you teach each week. That can open up a lot of possibilities. On the other hand, if you want to make money for teaching, then it’s important to be realistic about your needs. Examine your finances and determine how much you need to make. This will be invaluable as you embark on the next steps. 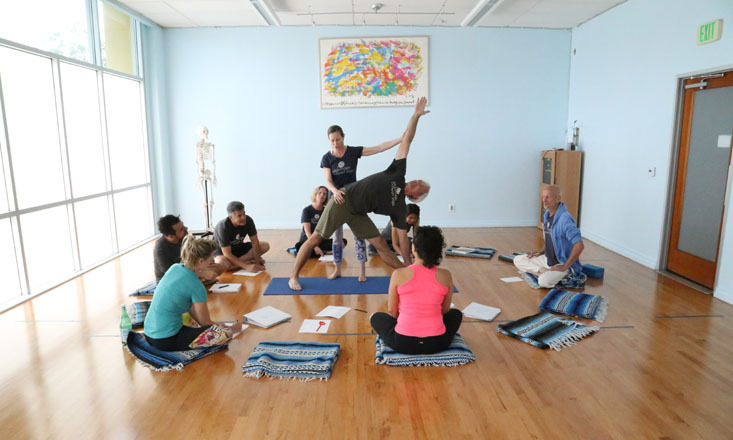 The 2016 Yoga in America Study conducted by Yoga Journal and Yoga Alliance determined that 65 percent of yoga teachers teach part time (fewer than ten hours a week). For those who teach full time, they may schedule their classes in a variety of different ways. Here at our studio in San Diego, we have over 30 teachers, some of whom are employees and some of whom are independent contractors. We limit independent contractors to three classes a week. Some of them have jobs in other fields, and others teach at a number of different studios in order to build the hours they need to support themselves. For some of our employees, yoga is full time. They teach eight classes a week and work 10-20 hours a week at the front desk or in management. There are many options available to you depending on your vision. As a new teacher, the most important step you can take as you embark on this new stage of your journey is to envision the type of lifestyle that you want with regard to teaching yoga. Create a vision board or write in a journal so that you can be clear in your intention. Tell the universe you want to share yoga and be specific with your vision: full time, part time, private classes, group classes, populations you wish to teach, and types of environments you want to work in. Keep your personal practice consistent and take every opportunity that comes your way.